It’s terrifying just to think about it. But that is precisely what many riders and parents of young riders in and around Wilmington, East Sussex are thinking at the moment. 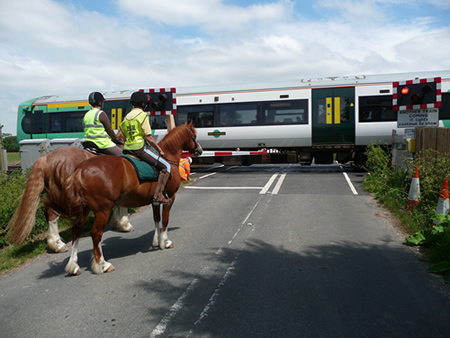 For suddenly – mysteriously – horses have started spooking whenever they cross their local level crossing on the busy London to Eastbourne line. So much so, that many riders have stopped trying to cross it altogether. “Some riders say their horses have been electrocuted. But I can’t believe that. The horses might have put their shoes on the rail. The shoe might have slipped. And that might have created some friction but I can’t see how the horses could be electrocuted. “Other riders blame the mats. Before they put the mats down the horses were in direct contact with the tarmac. Now they put their feet on the mats. The mats are squishy. Their feet sink into then. Maybe that spooks them. “Whatever the reason, something has got to be done about it because it’s dangerous. Moya explained what happened when she rode Phoenix, a six-year-old Palomino over the crossing for one of her liveries, Claire Bassett. 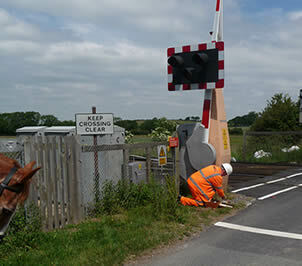 “As I said, I’ve been riding over this level-crossing for nearly 20-years. On this occasion, he touched the metal rail and, literally, leapt into the air. I stayed on. Luckily. But I could have come off. He could have bolted up the railway line. Anything could have happened. It’s frightening to just think about. Something has got to be done. Moya has already contacted Network Rail, East Sussex County Council, her local Council as well as The British Horse Society.